Head injury has been the leading cause of death and disability in people younger than 40 years and the incidence is rising continuously. 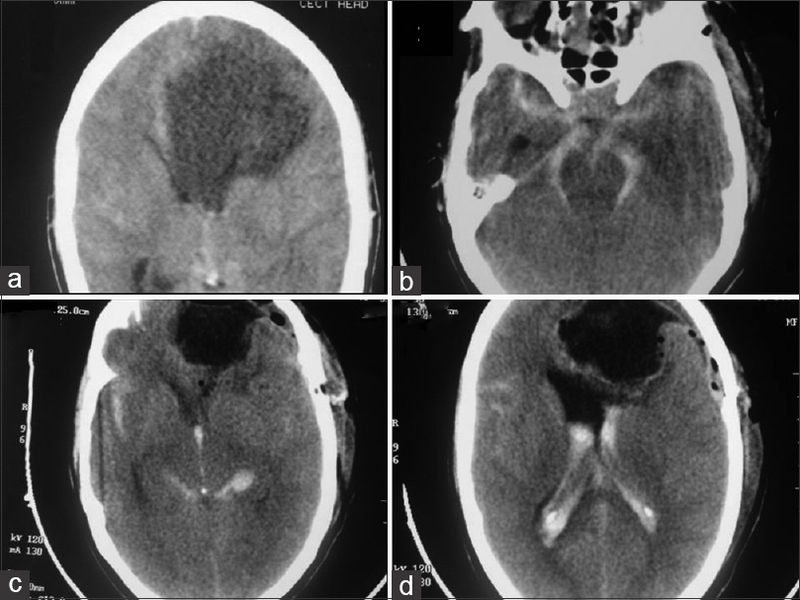 Anticipation of the pathological consequences of post-traumatic subarachnoid hemorrhage (tSAH) and an outcome-oriented management are very important in these cases. To encounter the complications pertaining to traumatic brain injury (TBI) and tSAH, various classifications have been proposed and goal-oriented screening strategies have been offered. 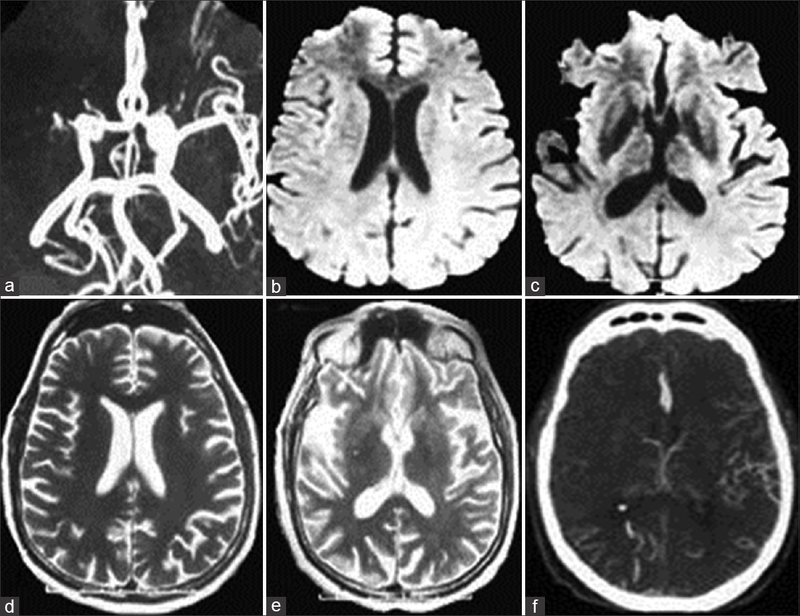 The role of serial computed tomography (CT) scans, perfusion studies, transcranial Doppler, magnetic resonance imaging (MRI), and angiographic studies as diagnostic tools, has been described. Recently, MRI fluid-attenuated inversion recovery (FLAIR), gradient reversal echo (GRE), and susceptibility weighted imaging (SWI) have emerged as excellent complimentary MRI sequences, and the authors of this article have evaluated their role in the diagnosis and prognostication of patients with tSAH. Numerous studies have been conducted on the various complications associated with tSAH such as vasospasm, hydrocephalus, and electrolyte disturbances and their management. This article discusses these aspects of tSAH and their management nuances. Traumatic intracranial aneurysms (TICA) are rare in occurrence, constituting less than 1% of the total cases of intracranial aneurysms. Cervical posttraumatic aneurysms arising from major blood vessels supplying the brain are also extremely rare. Their variable locations, morphological variations and the presence of concomitant head injury makes their diagnosis and treatment a challenge. 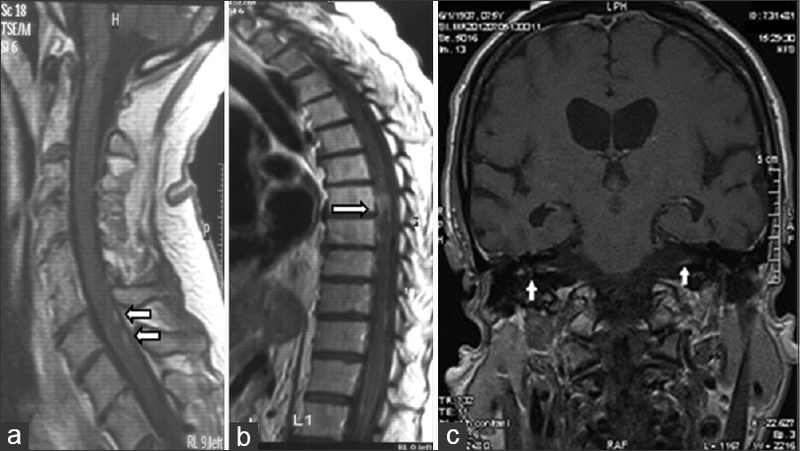 In this review, we discuss the epidemiology, etiology, classification and management issues related to TICA as well as traumatic neck aneurysms and review the pertinent literature. 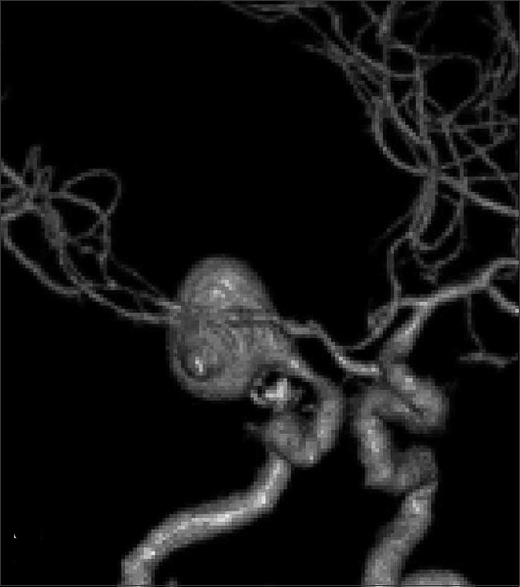 Conventional endovascular coiling remains the mainstay of treatment for most aneurysms; however, it may not be suitable for aneurysms with a complex geometry and there remains the risk of recanalization. Aneurysms with an unfavorable morphology are difficult to treat through both endovascular and surgical means. Progress in endovascular technology has allowed for the emergence of newer strategies to treat aneurysms with a complex geometry. Better packing density in wide-necked and large aneurysms can be achieved through the balloon remodeling technique. Similarly, a self-expanding stent cannot only act as a scaffold that helps to retain coils but also aids in diverting the blood flow away from the aneurysm sac. Lately, focus has shifted from endosaccular occlusion to endoluminal reconstruction; flow diverters are being increasingly used to treat aneurysms with an unfavorable geometry. However, there is no clear consensus on the best endovascular management strategy in certain subset of aneurysms - large and giant internal carotid aneurysms, blister aneurysms, and fusiform/dissecting aneurysms of the vertebrobasilar artery. 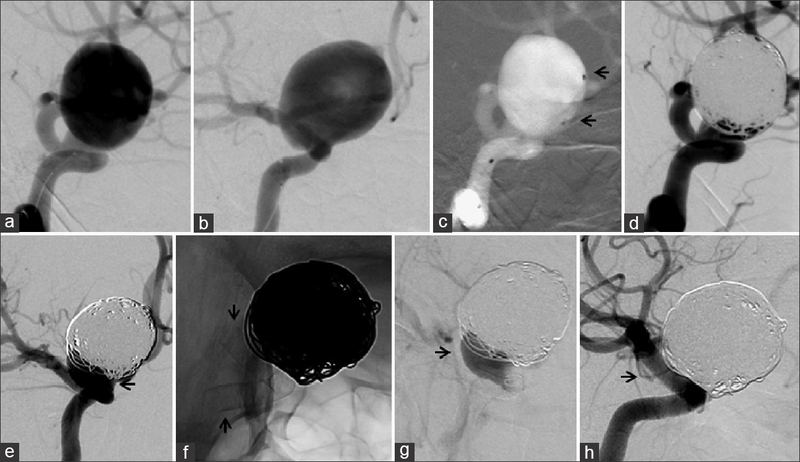 We present a review of literature and discuss the current evidence for the various endovascular strategies to treat complex aneurysms. Purpose: Arterial spin labeling (ASL) is a noninvasive magnetic resonance (MR) perfusion technique to detect changes in blood flow. 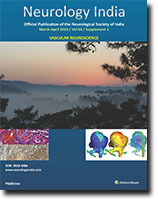 This study was undertaken to obtain a reference set of normal values of cerebral blood flow (CBF) in different age groups using three-dimensional pseudocontinuous ASL (3D PCASL) technique. The existence of an age-related decline in the gray matter (GM) and white matter (WM) CBF was evaluated. The gender-related CBF was also analyzed. Materials and Methods: One hundred and sixty normal volunteers of varying age (6-72 years), arranged in 4 age groups, underwent MR perfusion imaging using 3D PCASL technique at 3 Tesla (T). 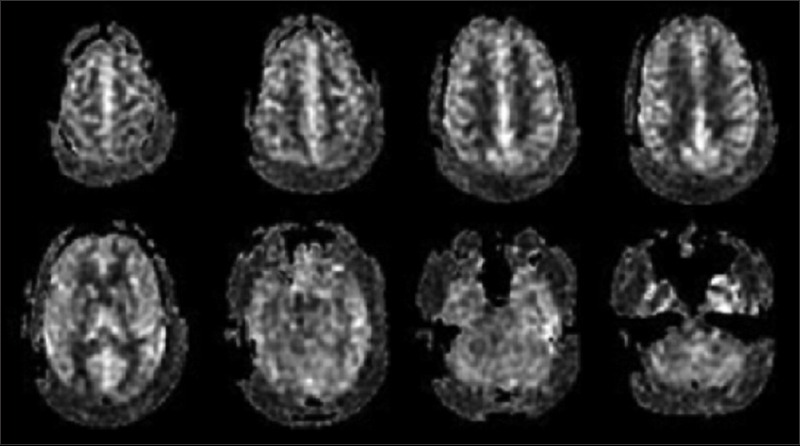 Mean CBF values in global and regional GM and WM in different age groups were extracted from the quantitative perfusion map. Results: A significant negative correlation was observed between the age and mean GM and WM CBF values (r = −0.80, P = 0.001; r = −0.59, P = 0.001, respectively). Similar results were also observed between age and various regional mean GM and WM CBF values (P = 0.001). No significant effect of gender on the GM CBF and WM CBF was found in any age group (P > 0.05). Conclusion: PCASL technique provides reliable quantitative parameters for the precise mapping of age-related perfusion changes occurring in the normal brain. Background: In-hospital care of stroke patients can reduce the risk of death and disability. There is an emerging evidence for the routine use of care pathways (CPs) for acute stroke management. Our aim was to develop evidence-based CPs and test the hypothesis that acute stroke management by CPs is superior to that provided by conventional care. Materials and Methods: An acute stroke CP was designed in accordance with the recent American Stroke Association (ASA)/American Heart Association (AHA) stroke guidelines and the Indian Academy of Neurology (IAN) stroke management guidelines in India. A total of 162 acute stroke patients, who were managed within 72 hours of onset of their symptoms, were enrolled prospectively in two groups-the stroke care pathway (CP) arm (n = 77) and the conventional care (CC) arm (n = 85). The incidence of aspiration pneumonia, complications during the hospital stay, and death or dependency at discharge and at 90 days were among the main outcomes of our study. Results: The CP arm had a lower incidence of aspiration pneumonia (AP) in comparison with the CC arm (6.5% vs. 15.3%, risk ratio [RR] = 0.42, 95% confidence interval [CI] = 0.16-1.14, P = 0.062). The CP group had a decreased risk of requirement of mechanical ventilation (7.8% vs. 17.6%, odds ratio [OR] = 0.39, 95% CI = 0.14-1.07, P = 0.05). Barthel and modified Rankin Scale scores were similar in both the groups, but death at 90 days was significantly lesser in the CP arm (7.8% vs. 20%, P = 0.022). This benefit was most prominent in the Glasgow Coma Scale (GCS) subgroup scoring 9-15 (RR = 0.16, 95% CI = 0.03-0.71). There were no significant differences in the other outcome measures. Conclusion: Stroke CPs reduce the incidence of aspiration pneumonia, the need for mechanical ventilation, and the risk of death, when assessed at a follow-up of 90 days. Background: Stroke is a major cause of death and disability. 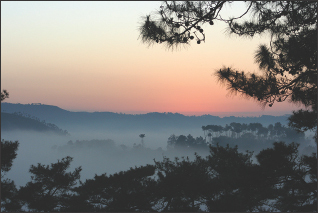 Asia is the largest and mostly populated continent of the world. The Asian Stroke Advisory Panel (ASAP) consists of stroke neurologists from 12 different countries in 13 Asian regions. It has been established for 17 years, and holds regular meetings for reviewing the stroke activities in Asia. It also helps in conducting several multinational research projects. This study is one of the ASAP projects and aims to explore stroke care systems in member countries in Asia. Methods: The survey is categorized into five main parts including the general country information, stroke epidemiology, stroke risk factors, stroke care systems, and national stroke professional societies. 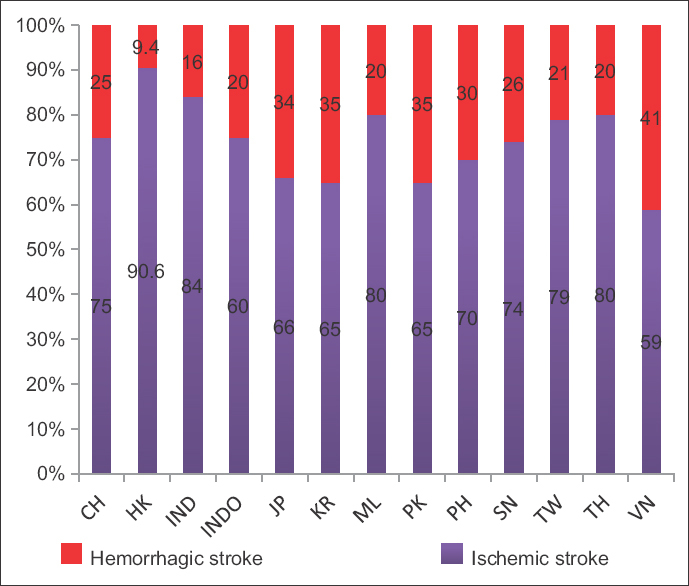 Results: A higher proportion of ischemic stroke in comparison to hemorrhagic stroke was found in all countries. The overall incidence of stroke in Asia is between 116 and 483/100,000 per year.When compared to 1999, a 2-3-fold increase in the number of neurologists was observed in all countries. Conclusions: There is a favorable trend in all Asian countries regarding the need to increase the number of neurologists and facilities to effectively administer stroke care. Aims: To evaluate the safety and efficacy of endovascular intervention in the treatment of ruptured vertebrobasilar dissecting aneurysms (VBDAs) with the aim of developing endovascular treatment standards for this disorder. Materials and Methods: The results of 40 consecutive patients with ruptured VBDAs, who were treated with internal trapping (n = 7), stent(s)-assisted coiling (n = 26), and solely stenting (n = 7) from January 2010 to June 2014, were retrospectively reviewed and analyzed. 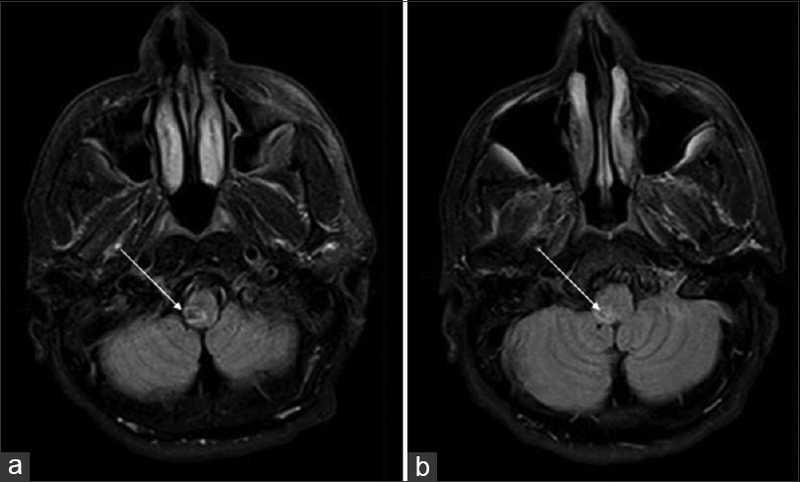 Results: A treatment protocol for the ruptured VBDAs was created and proved to be effective. All 7 patients treated with internal trapping had satisfactory outcomes; none had treatment-related complications, rebleeding, or recanalization after treatment. 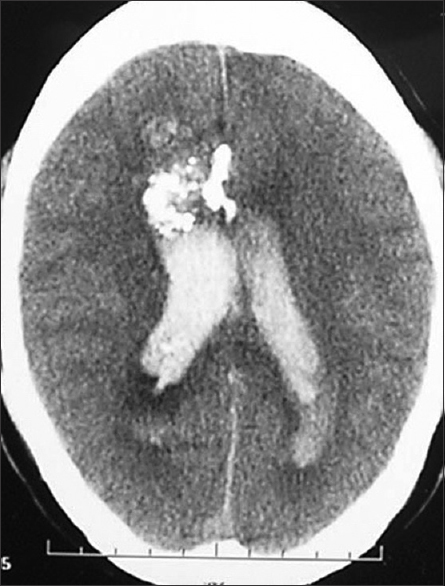 Of the 26 patients treated with stent-assisted coiling, one patient suffered from an acute in-stent thrombosis during the operation, one had a small cerebral cortical infarction, one had rebleeding, and one had recanalization of his obliterated aneurysm after surgery. Of the seven patients treated solely with stenting, one patient had recanalization and two patients suffered rebleeding, of whom one patient died. 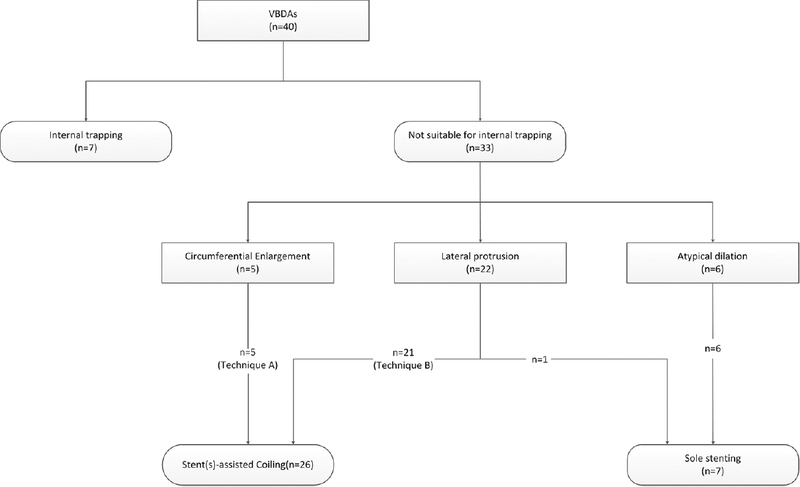 Conclusions: The treatment protocol for ruptured VBDAs proposed in this study proved to be a simple and effective method in selecting the requisite treatment. If a proper endovascular strategy is in place, an effective treatment outcome for ruptured VBDAs can be obtained. Background: The management of intracranial aneurysms (IAs) varies widely depending upon a number of factors. Objective: To understand the variations in practice patterns in the treatment of IAs in India. Methods: The survey consisted of 23 questions. Two group emails were sent to members of the Neurological Society of India and the Neurological Surgeons Society of India. Uni- and multivariate analysis was performed where appropriate. Results: The response rate was 10.13% (150/1480). Fifty percent of the respondents used steroids in subarachnoid hemorrhage and 64% initiated triple-H therapy prophylactically. There was no significant difference in the use of steroids, antifibrinolytics, mannitol, or hypertonic saline and the choice of therapeutic intervention (clipping or endovascular therapy [EVT]) for anterior circulation aneurysms between physicians working at teaching and nonteaching hospitals. However, physicians in teaching and government hospitals were less likely to choose EVT for middle cerebral artery aneurysms as the first line of treatment (odds ratio [OR] 0.6 and 0.1, respectively). 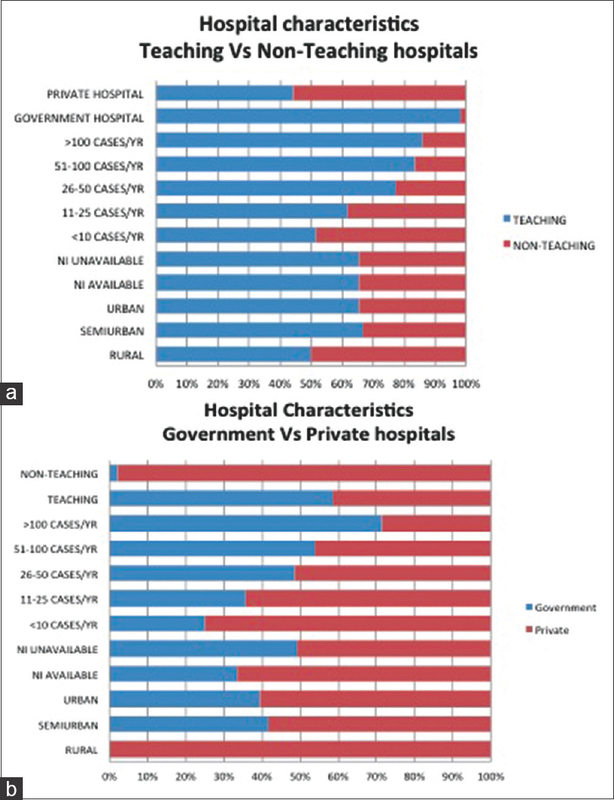 Physicians working at private hospitals were more likely to have EVT facilities than those working in government-owned hospitals. On multivariate analysis, physicians working in teaching hospitals preferred surgical clipping to EVT for posterior circulation aneurysms (OR = 0.7) and physicians at teaching hospitals performed >50 cases/year. Conclusion: Our study demonstrates the prevailing practice patterns in the management of IAs in India. Surgical clipping is the preferred treatment of choice for anterior circulation aneurysms and EVT for aneurysms along the posterior circulation. Corticosteroids and prophylactic "triple-H" therapy are still used by a large proportion of physicians. Background: Stent-assisted coiling (SAC) in the treatment of ruptured intracranial aneurysms (RIAs) remains controversial. Aims: In this study, we report our experience of SAC of wide-necked RIAs and evaluate the risk factors contributing to periprocedural complications. 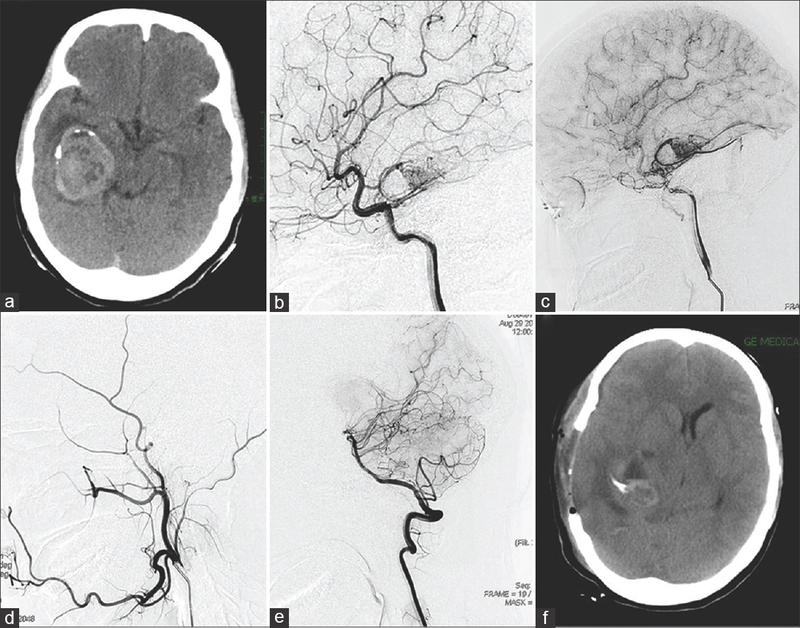 Materials and Methods: 218 patients underwent SAC for ruptured, wide-necked saccular intracranial aneurysms at our center between 2011 and 2014. Multivariate logistic regression analysis was performed to evaluate the risk factors contributing to the periprocedural complications. Follow-up angiography was available in 178 (84.8%) patients. Clinical outcome was measured using the Glasgow Outcome Scale (GOS) through telephonic interviews. Results: Periprocedural complications occurred in 33 (15.1%) patients out of which 17 were thromboembolic (7.8%) and the remainder were hemorrhagic complications (n = 16, 7.3%). Multivariate logistic regression analysis showed that a positive history of hypertension (odds ratio [OR] 4.899, 95% confidence interval [CI] 1.266-18.951; P = 0.021), and daughter blebs (OR 12.165, 95% CI 3.247-45.577; P = 0.0001) were the major risk factors for the periprocedural hemorrhagic complications, but not for the thromboembolic complications. Angiographic follow-up (mean, 19.5 ± 11.9 months) showed Raymond scale (RS) 1 in 158 (88.8%) patients and RS2 in 20 (11.2%) patients without any angiographic recurrence. At a mean clinical follow-up of 29.1 ± 16.2 months, 201 out of the 210 surviving patients had a good functional outcome (GOS score of 4 or 5). Conclusions: SAC is an effective treatment option for selected ruptured wide-necked aneurysms, especially in patients who do not require external ventricle drainage for acute hydrocephalus. 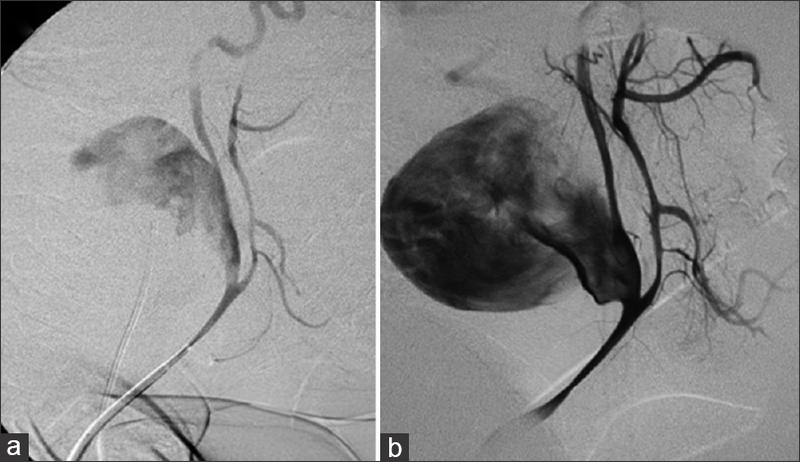 The periprocedural hemorrhagic complications tend to be more common in the hypertensive patients and in those with daughter blebs in the aneurysm sac. Introduction: Moyamoya disease (MMD) is a chronic cerebrovascular disease characterized by stenosis/occlusion of bilateral terminal internal carotid arteries with the development of collaterals at base of the brain. We describe our experience of treating 70 patients (133 involved hemispheres, 108 hemispheres operated) surgically. Patients and Methods: Surgically treated patients with MMD from 2006 to 2014 were reviewed retrospectively. There were 70 patients (54 pediatric, 36 females, range 2-46 years). Seven had a unilateral disease. 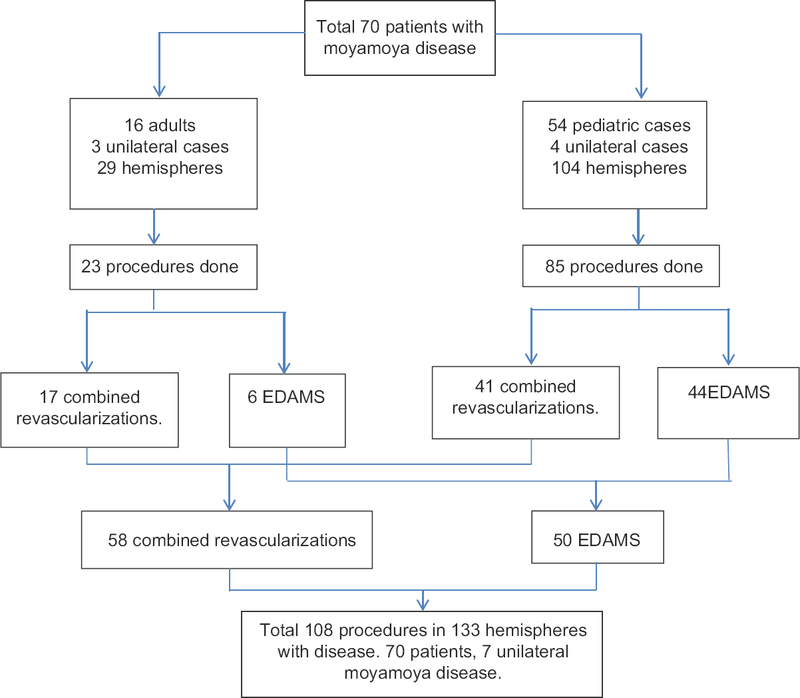 One hundred and eight of 133 hemispheres underwent surgery; 58 underwent combined revascularization (superficial temporal artery − middle cerebral artery bypass and encephalo-duro-arterio-myo-synangiosis [EDAMS]); and, 50 underwent an indirect revascularization (EDAMS). 17/23 adult brain hemispheres and 41/85 pediatric hemispheres underwent combined revascularization. Results: The median follow-up was 15.9 months (range 3-62 months). The mean modified Rankin scale score at presentation and follow-up were 2.27 ± 1.034 and 1.80 ± 1.269, respectively. There was an overall significant improvement in the clinical status in the operated patients (P < 0.001) at follow-up. The clinical improvement (admission to follow-up) was better in pediatric patients compared to the adults (P < 0.001 vs. 0.769). The combined revascularization gave better clinical improvement than the indirect one (P = 0.024 vs. 0.0312). There were three postoperative strokes and one death. The morbidity rate was 2.8%, and the mortality rate, 1.4%. Other patients were symptom-free at the latest follow-up. 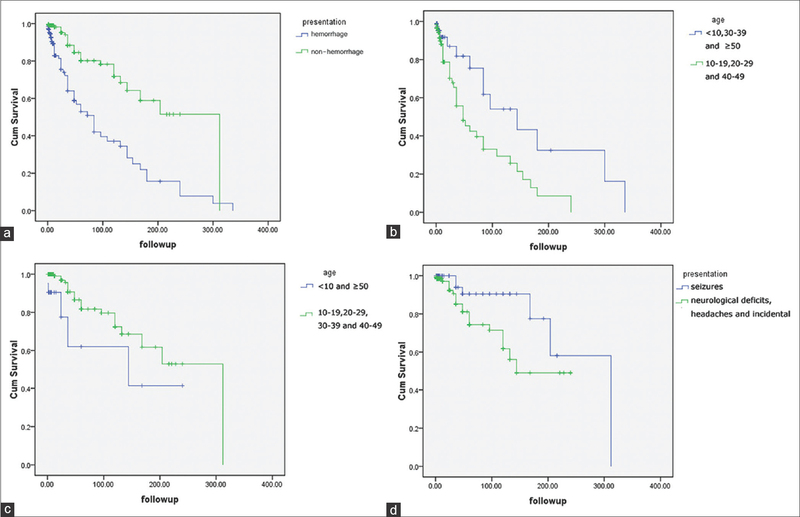 Angiographic outcome did not statistically correlate with age, anastomosis type, or Suzuki grade, though there was trend toward better angiographic outcomes in patients who underwent a combined revascularization. Conclusion: Both the combined and indirect revascularization procedures are effective in treating MMD. Pediatric patients had a better clinical improvement after surgery than the adult patients . Patients undergoing combined revascularization had a better clinical status compared to those who only underwent indirect revascularization. Combined revascularization surgery should be the surgical strategy in all age groups as it is feasible in a significant proportion of pediatric patients too. Background and Purpose: The major determinants of hemorrhage in an arteriovenous malformation (AVM) include its angioarchitecture, as well as the patient's age and clinical presentation. The aim of this study was to determine whether or not the risk of hemorrhage in an AVM differs based on the different clinical presentations and the initial age at diagnosis. 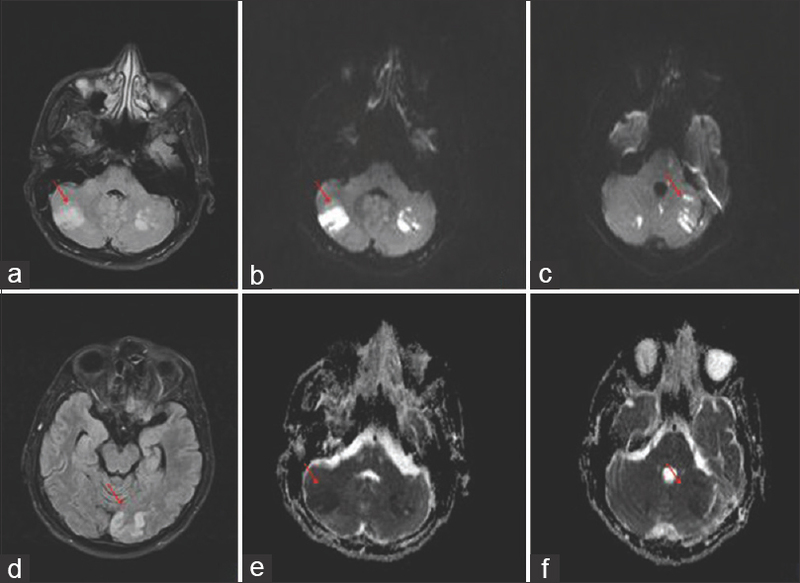 Methods: A consecutive case series of 496 patients having a brain AVM was retrospectively analyzed. 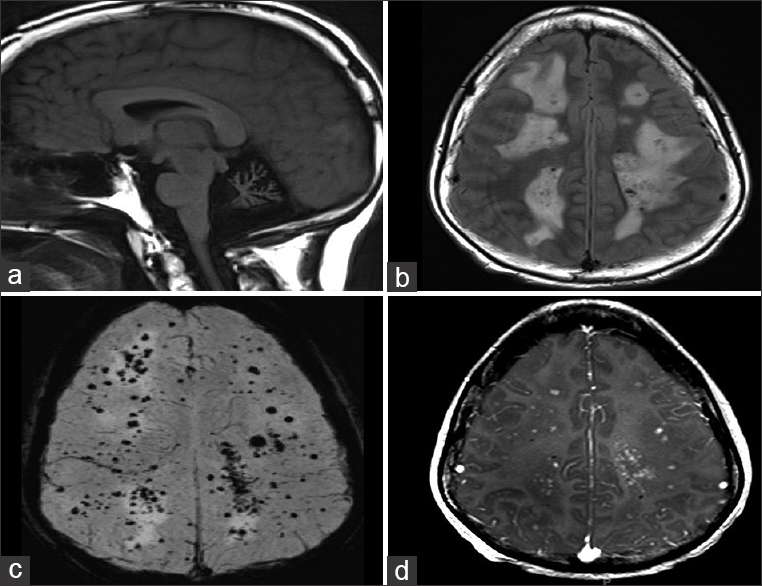 The radiological evidence of hemorrhage was established in 84 of these cases after the initial diagnosis of AVM had been made. These cases were analyzed using univariate analysis and Kaplan-Meier curves with respect to age at diagnosis, the clinical presentation of patients harboring the AVM as well as the Spetzler-Martin grade of the AVM. Results: Hemorrage occurred in 84 patients with an AVM during a mean duration of 2.5 years (range, 1month-28 years). In univariate analysis, a subsequent hemorrhage within an AVM was associated with the following factors: When the patients initially presented with a hemorrhage, and, had a younger age (<30 years), female gender, and Spetzler-Martin III and IV grades. By analysis of the Kaplan-Meier curves, it was estimated that the annual hemorrhage rate was 12.3% in those cases who initially presented with hemorrhage, compared with 3.5% for those cases whose initial presentation was not associated with AVM bleed. 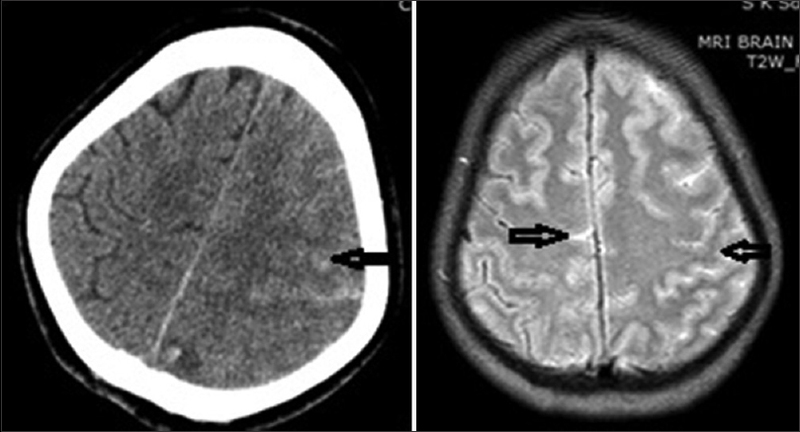 In the latter category (i.e., patients who did not have hemorrhage as the initial presentation), the annual rate of subsequent hemorrhage was lower for those patients who initially presented with seizures than those who had other initial presentations (such as those having neurological deficits, headaches, or those incidentally detected to be having an AVM) (with the bleeding rate being 1.9% in those with seizures as the initial presentation vs. 4.6% for the other presentations or those with incidentally detected AVMs, P = 0.002). Conclusions: The subsequent occurrence of hemorrhage in an AVM was associated with the initial presentation of hemorrhage, a younger patient's age (<30 years), the female gender, and Spetzler-Martin grades III and IV. The risk of subsequent hemorrhage in patients with an initial presentation of a seizure was lower than the risk of hemorrhage that occurred with other presentations. Patients with an AVM who present with recurrent headaches, and those in whom the AVM has been detected incidentally, should also be kept under surveillance as they too manifest a risk of a subsequent hemorrhage. 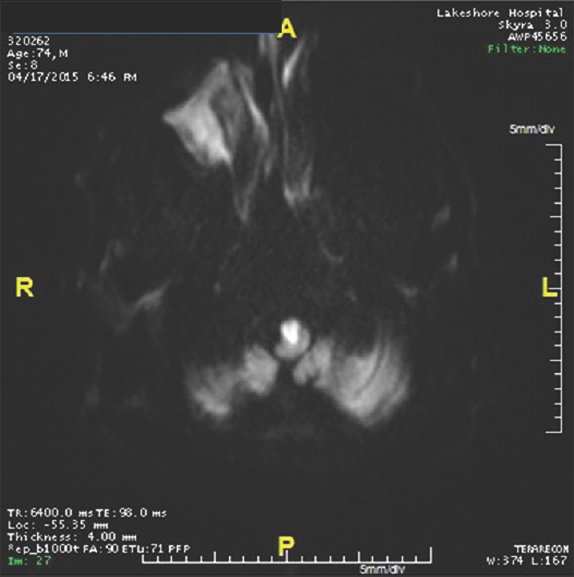 We report a patient with progressive supranuclear palsy and incidentally detected the absence of right middle cerebral artery (MCA) without any old or acute infarct in its territory. The magnetic resonance angiography and computed tomography angiography failed to detect any significant collateral circulation. We discuss the embryogenesis of brain circulation and offer a possible explanation for the nonvisualization of the right MCA in our patient. Although hemodynamics plays a key role in the genesis, expansion, and rupture of an aneurysm, quantified hemodynamic parameters for comparison have not been standardized for predicting the risk of rupture of intracranial aneurysms. Computational fluid dynamics is being increasingly used in near-realistic, patient-specific simulation of blood flow in intracranial aneurysms. A simulation was carried out on the computed tomography (CT) angiogram image of a patient harboring a giant internal carotid artery aneurysm. Since the CT angiogram was performed a few hours before the fatal rupture of the aneurysm, the study could give an insight into the hemodynamics of the aneurysm that tipped it to rupture. Wall shear stress, pressure distribution, and flow streamlines were obtained using computational methods. These objective results could form the basis of reference for future studies employing simulation techniques for predicting aneurysmal rupture.